Docs argue for safe-injection sites for illicit drugs in the U.S. The Overdose Prevention Site on the grounds of St. Paul's Hospital is housed in a tent. It opened in May. Some U.S. physicians would like hospitals to consider opening safe-injection sites on their campuses to reduce the chance of addicted patients overdosing on illicit drugs while receiving medical treatment, as two Canadian hospitals recently have done. 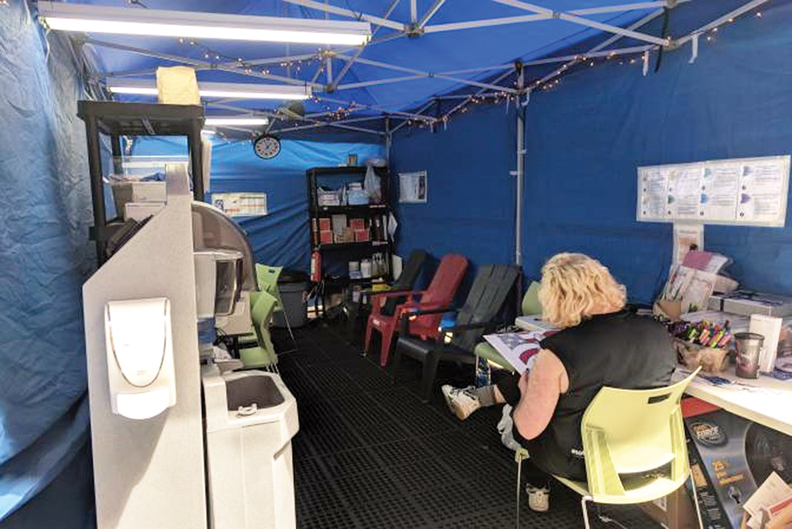 In May, St. Paul's Hospital in Vancouver opened what it calls an Overdose Prevention Site in a tent on the hospital grounds. Patients being treated for medical problems can leave the hospital unit with assistance, if needed, go to the site to inject and return. About 15 patients a day have been using the facility, said Scott Harrison, director of the hospital's substance abuse treatment program. It offers clean needles, injection supplies and take-home kits of naloxone for reviving people who overdose, plus monitoring by peer workers and emergency care. First, Lahey and his colleagues want to expand medication-assisted treatment. But many patients won't enter treatment, he said. As a result, it's not uncommon to see patients choosing between getting medical treatment for a life-threatening condition or leaving the hospital to use drugs. “That's why in-hospital safe-injection sites should be explored,” he said. The Trump administration has signaled that it considers safe-injection facilities illegal, but San Francisco, Seattle and Philadelphia are moving to open sites anyway. No U.S. hospitals have opened such sites yet. Since its site opened, St. Paul's has seen about a 25% decrease in patients leaving before their medical treatment is completed. Previously, Royal Alexandra Hospital in Edmonton in April became likely the first hospital in North America to open a supervised injection site for patients. Addicts can get sterile needles and self-inject from a supply they can store in a locked safe at the hospital. St. Paul's Harrison sees a safe-injection site as the obvious right thing to do.